This June at #Identiverse in Boston I had quite an epiphany during Eve and Mike’s session. I finally realized that User-Managed Access 2.0 protocol (aka UMA2.0) is not that complicated to understand and VERY similar to some OAuth2 flow we all know. Let me try and convince you. Before taking the shovel and digging deeper, remember that UMA2.0 was actually designed as a new grant type of OAuth2 and not as a new protocol. If you already know OAuth 2.0, then you can understand UMA2 in less than 10 minutes. I promise. 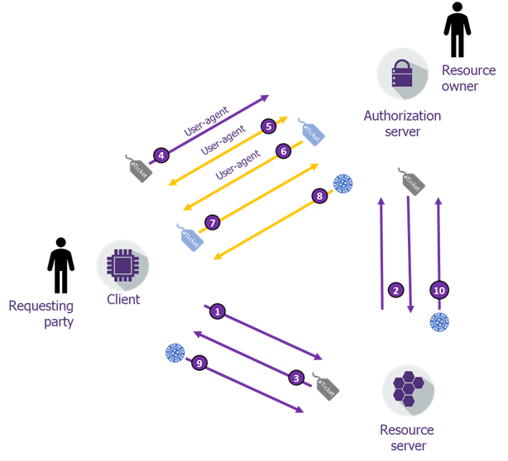 The client optionally requests a Requesting Party Token (RPT, see it as UMA’s custom form of an access token) directly against the authorization server’s token endpoint using the permission ticket. The resource server optinnaly requests the Authorization server to validate the RPT (using the OAuth2 introspection endpoint) (following RFC 7662 Token Introspection extended by UMA2) or can do that locally depending on the token’s format. Yes, steps 5 to 8 are VERY much like the OAuth2 authorization code grant. So yes it is not the same. Yes there are some steps before the highlighted part and it is a tiny bit longer. Now User-Managed Access has been designed for a reason. And that reason is not to just rename a few OAuth2 artifacts. There are some differences that enable UMA2.0 to work beyond OAuth2 standard capabilities. Special thanks to Eve Maler for her insight while writing this article.